From September 1938, before the start of the WWII, specific measures were put in place to protect the Bayeux Tapestry and the municipal collections of Bayeux. The Tapestry, together with most of the collections from the city’s museum, was therefore removed and placed in a secure storage repository. In 1939, the Bayeux Tapestry was placed in an underground shelter at the Hotel du Doyen where it remained for two years, opened out each month in order to check its state of conservation. The political and military significance of the Tapestry was of particular interest to the Nazis: German teams from the Ahnenerbe (research and teaching institute of ancestral heritage) were asked to study it. In 1941, the Tapestry was transferred by van to the National Museums repository in Sourches (Sarthe region), where it remained until 26 June 1944. Faced with the allied advance, the German authorities requisitioned the Tapestry and sent it to the Louvre in Paris. In the memoirs of General Dietrich von Cholitz, military governor of “Greater Paris”, the Bayeux Tapestry was connected with events surrounding the Liberation of Paris (19-25 August 1944). 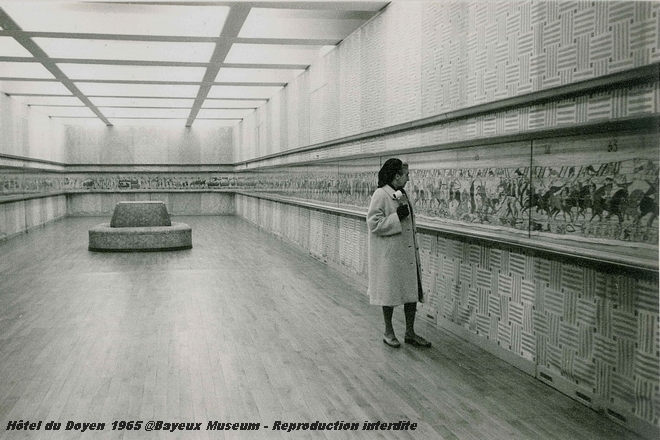 Since the Tapestry was already at the Louvre, a new exhibition was organised (the previous one had been in 1804), and was held from 10 November to 15 December 1944 in the Italian Primitives room. The Tapestry was displayed on a 70-metre long picture rail, enabling the entire composition to be taken in by the viewer. It returned to Bayeux in March 1945. In October, it was once again put on display in a glass showcase at the Hotel Doyen, and at this point new ways of presenting it to the public began to be explored. “We, once conquered by William, have now set free the Conqueror’s native land”. This inscription is on the memorial of the British military cemetery, erected at Bayeux by the British government as a tribute to the Commonwealth soldiers who perished in the Battle of Normandy during the summer of 1944. Many connections have been made between the Bayeux Tapestry and the Normandy Landings of 1944. 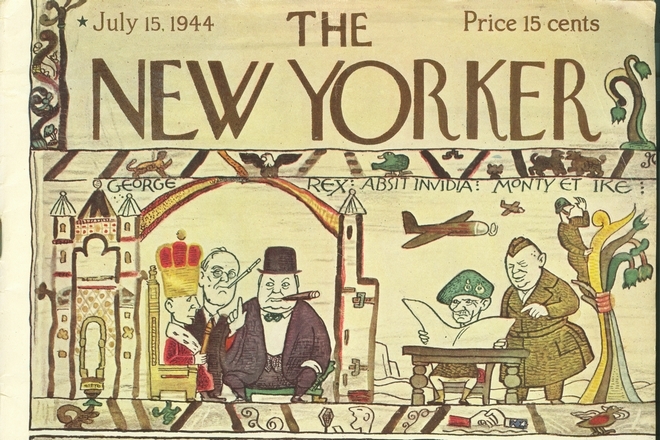 One of the most notable examples is the front page of the 15 July 1944 edition of “The New Yorker”, where the D-Day landings in Normandy are described in the form of a frieze with drawings in the style and colours of the thousand-year-old embroidery.